5 Ways to Cook Eggs – You Try It! A grown-up can help melt a little butter in a frying pan over medium-high heat. Crack the egg carefully into the frying pan. Cook the egg until the white is mostly solid. Choose how you want to cook the egg, and follow the directions below. Sunny Side up – Cook the egg on one side only. Cover with a lid and cook until the egg white sets. Over Easy – Cook both sides of the egg until the white is set, but keep the yolk runny. Over Medium – Cook the egg on both sides until the white is set and the yolk is a tiny bit runny. Over Hard – Cook the egg on both sides until the white and the yolk are both hard. Broken – Break the yolk with a spatula and cook the yolk and white until solid. The most important skill to cooking eggs is cracking them without breaking the yolk. Here’s a simple video that will make your kids egg-cracking experts. We even have a recipe for Heart Eggs using a cookie cutter and toast which uses the Sunny Side Up method and lets kids put their cooked with love eggs on the breakfast table. If your kids have learned to hard-boil their eggs, there’s a fun way to turn eggs into chicks. Using eggs as ingredients in other recipes may require that they are separated. We’ve got you covered there too – here’s a simple way to separate eggs with a plastic bottle! 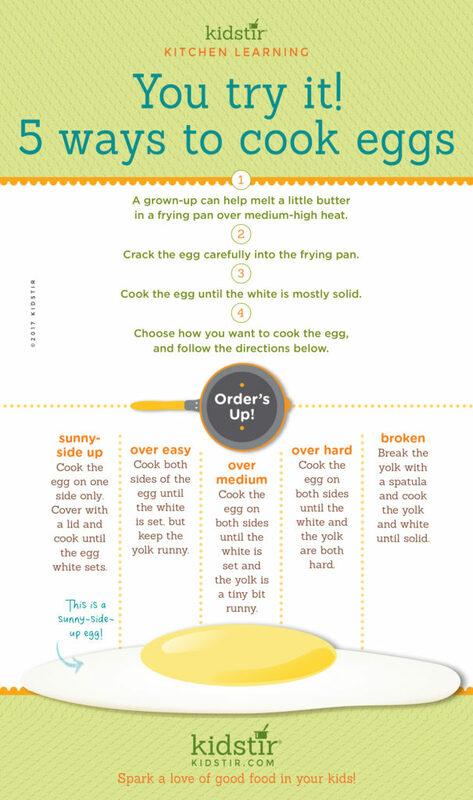 We’d love to offer the Kids How-to for Cooking Eggs in an Infographic for you to share on your blog. Just select and copy the code snippet below and paste into your next blog post. 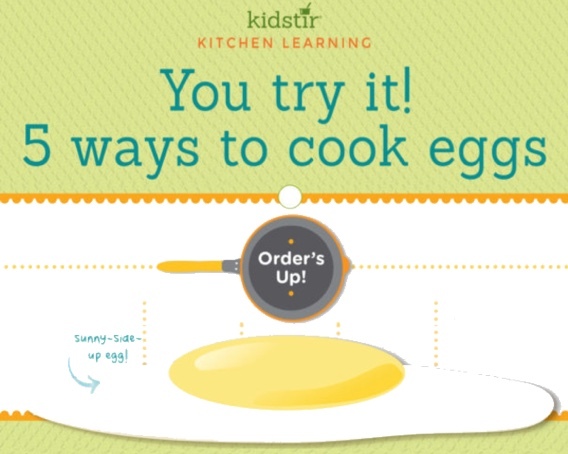 We’d love for everyone to share this page on social media or email using the buttons below so you can learn all 5 ways for with our Kids How-to for Cooking Eggs Infographic!